I was twelve when I first started cooking. It started with making a soup for my mom and two sisters who were down with a bad flu. I don't really remember how the soup turned out, but I remember how I felt after making it. I felt proud, in charge and responsible, all the feelings that a first child would come to acquire. Years have passed since that stressful afternoon of making soup, but I got to experience those feelings all over again when I made this fillet kabob. 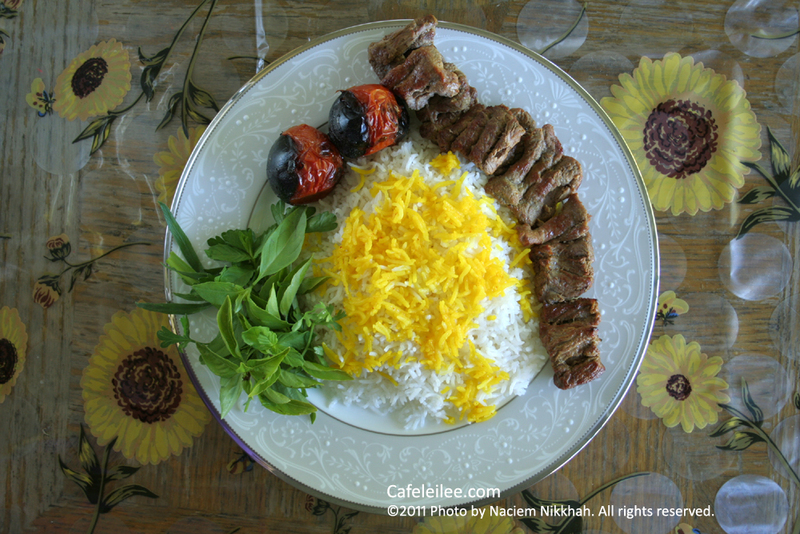 Kabob Barg (literally leaf kabob) in my opinion is the best of all Persian kabobs. 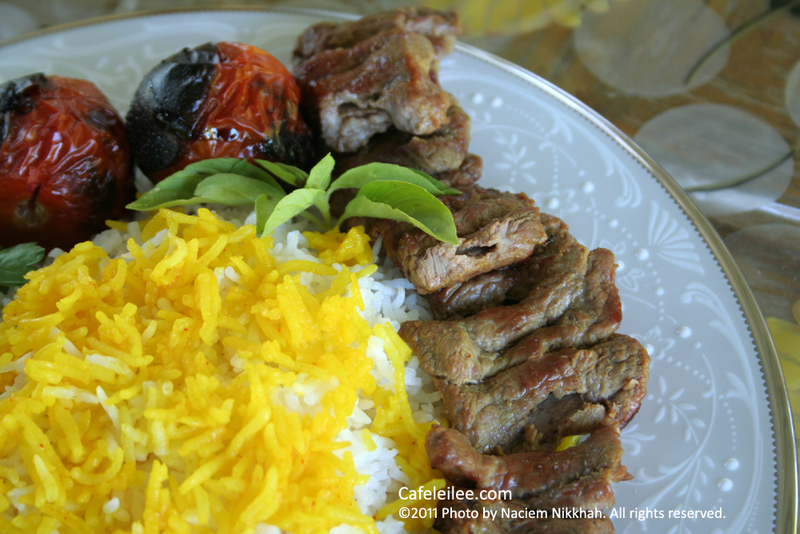 Thinly sliced lamb tenderloins are marinated in lemon and onion juice and then braised with saffron and butter over charcoal. It is one of the most delicate kabobs you will ever eat and probably one that most people will consider the hardest to make, which is why we never attempted to make it ourselves. Now this takes us to why I tried it now. I’ve been using a Persian cookbook filled with fascinating insights into Persian food history, more as a source for information than recipes and cooking tips. Having my mom as the master of Persian cooking I never felt I had to refer to a Persian cookbook, nevertheless one that’s written in English! But the intriguing information I found in the book made me feel obligated to write a review for it in my next post. And to complete my research on the book I decided to try a recipe. Since the book includes most practical recipes in Persian cuisine for which I have always relied on my mom as a source, I decided to give kabob barg a try, something I always felt intimidated to make. The hardest part as Margaret Shaida claims was not finding the perfect lamb tenderloin but slicing them thinly. It might have been because it was my first try but it took me almost an hour to make sure my two pounds of tenderloins were perfectly sliced. Do I really have to tell you the result!? The fact that the recipe is being published here is proof enough that it got ten thumbs up from all five members of the family. Lay the skewers across a shallow oven tray, squeez over the juice of two lemons, cover (with an inverted oven tray) and leave to marinate for an hour or so. An hour before grilling, add the juice of two onions (you'll need to finly grate them and then squeez the juice out through a cheese cloth) and leave to marinate. For the basting sauce, melt the butter and mix with the juice from the onion and the lemon, the liquid saffron, salt and pepper. When the charcoal is burning white, grill the kabobs for a minute on one side, turn and baste, using a pastry brush. After a minute or two, turn and cook on the other side, continuing to baste. When cooked, slide the kabob off the skewer and serve immediately with white rice as explained here. دوازده سالم بود که برای اولین بار آشپزی کردم. مادر و دو تا خواهرهام آنفلونزای خیلی بدی داشتن و من هم به عنوان دختر بزرگ خونه مجبور شدم یک سوپ درست کنم. یادم نمیاد که سوپش چجوری از آب در اومد ولی از احساسی که بعد از درست کردن سوپ داشتم مطمعنم. همش احساس افتخار و مسولیت داشتم. تمام حسهایی که یک فرزند نخست در طول زمان به دست میاره. سالها از اون بعد از ظهر دلهره آفرین گذشته ولی جمعه گذشته همه اون احساسات دوباره به من برگشت موقعی که این کباب برگ رو درست کردم. کباب برگ به نظر من بهترین کبابهای ایرانی هست و تا همین چند روز پیش فکر میکردم جزو سخت ترین ها. دستتون رو روی هر فیله قرار دهید و محکم فشار دهید، بعد با دقت ورقه های نازک ببرید (کلفتی هر ورقه باید حدود ۲ تا ۳ میلیمتر باشه). با پشت چاقو روی فیله ها را کمی بکوبید تا کاملا صاف شوند. حالا ورقه های فیله را به سیخ بکشید. برای اینکار از سیخ متوسط استفاده کنید، نه سیخ پهن. برای سیخ کشیدن فیله ها سیخ را به رو و زیر فیله حرکت دهید (مثل کوک زدن لباس) بعد گوشت را روی سیخ صاف کنید. سیخ ها را روی یک سینی کم عمق قرار دهید و آب دو لیمو را روی آن بریزید. روی کباب ها را با یک سینی بر عکس شده بپوشانید. و بگذارید حد اقل در یک ساعت بماند. یک ساعت قبل از اینکه میخواهید کباب ها را بپزید. آب دو پیاز رنده شده را بگیرید و روی کباب ها بریزید. سیخ های کباب را هر چند وقت یک بر بچرخانید تا همه اطراف کباب با مخلوط آب پیاز و آب لیمو آغشته شوند. برای سس روی کباب آب پیاز رنده شده را بگیرید و با آب لیمو مخلوط کنید. کره را آب کنید و با زعفران آب شده و نمک و فلفل به این مخلوط اضافه کنید. وقتی منقل آماده شد کباب ها را روی آتیش بگذارید. بعد از یک دقیقه کباب را بچرخانید و با یک فرچه از سس روی آن بدهید. کباب ها را هر یک دقیقه بچرخانید و و هر بار با فرچه از سس روی آن بدهید تا کاملا پخته شوند. پس از آماده شدن کباب ها آنها را در دیس بکشید و و با سبزی خوردن تزیین کنید. is so little and compact that it can be utilised in any specific room all-around your property. tissue which have been within the area likewise. of declaring that when you accomplish the work out with health and fitness bands the resistance increases as entire the movement. With it's distinctive and proprietary doorway anchors and Swift Clip Technique you will end up equipped to accomplish a workout routines from a huge selection of positions. you may grow old additional speedily.